Comments: Hardcover small octavo, sewn binding; Genesis: XII & 185 double pp. – Prayer Book: (2), 31 double–, 124 (87 of which are double) & 14 double pp. Masorah and Tefillah texts on right, translation on left side of double page. Scripture texts in single column, no extras. The Psalm headings in the Prayer–Book part are translated. Haphtara texts for Genesis are taken from I Sam • I & II Kings • Isaiah • Ezekiel • Hosea • Amos • Obadiah (complete) • Zechariah • Malachi. Pss 19 • 29 • 33 • 34 • 90 to 93 • 95 to 99 • 104 • 113 to 118 • 120 to 136 • 145 to 150 • Prov. 31:10 f • I Chr. 16:8-37 & 29:10-13 • Neh. 9:5-12. 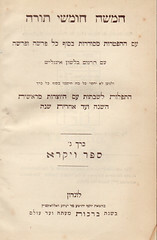 Note: The Publisher‘s name appears also in the Hebrew subtitle, but not with his civil first name „P.“, but with his Hebrew name, יוסף יהושע בר יצחק ואללאינטיין, transcribed Yoseph Yehoshua bar Yitzchak Vallentine, provided Y. Y. Y. (or, Joseph Joshua ben Isaac) and P. Vallentine are one and the same person. Not clear is which "able pen" was responsible for the translation; this question of authorship needs clarification. Further details from expert readers are highly welcome! The term "Haphtorah" in the title is incorrect, as two contemporary bibliographers, Moritz Steinschneider and Julius Benzian already had noted and provided with a (sic! ); it should read "Haphtaroth". Contents: Book of Exodus, Haphtaroth. – 43 chs of Psalms • Proverbs 31 • I Chr. 16 & 29 • Neh. 9. – Prayers etc. (see above). Index to Vol. II. Comments: Hardcover small octavo, sewn binding; Exodus: (12) & 174 double pp. – Prayerbook: (2), 31 double–, 124 (87 of which are double) & 14 double pp. Masorah and Tefillah texts on right, translation on left side of double page. Scripture texts in single column, no extras. 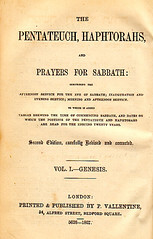 The Psalm headings in the Prayer–Book part are translated. There‘s no Preface written for this second volume. Haftarah texts vor Exodus are taken from Judges • I Sam. • I & II Kings • Isaiah • Jeremiah and Ezekiel. Contents: Book of Leviticus w/ Haphtaroth. – 43 chs of Psalms • Proverbs 31 • I Chr. 16 & 29 • Neh. 9. – Prayers etc. (see above), and "The Ethics of the Fathers" (Pirkei Avoth פרקי אבות). Index to Vol. III. Comments: Hardcover small octavo, sewn binding; Leviticus: (12) & 135 double pp. 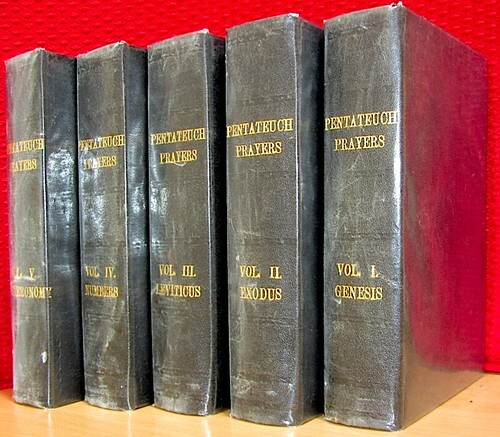 – Prayerbook: (2), 31 double–, 218 (87 of which are double), 9 double, XIV double & 29 double pp. Masorah and Tefillah texts on right, translation on left side of double page. Scripture texts in single column, no extras. The Psalm headings in the Prayer–Book part are translated. There‘s no Preface written for this third volume. Additionally to the Prayer Book texts the Mishna tract "Ethics of the Fathers" (Pirkei Avoth פרקי אבות), from the Talmud Bavli (Tb) is printed. I & II Samuel • II Kings • Isaiah • Jeremiah • Ezekiel • Amos and Malachi. Contents: Book of Numbers w/ Haphtaroth. – 43 chs of Psalms • Proverbs 31 • I Chr. 16 & 29 • Neh. 9. – Prayers etc. (see above). Index to Vol. IV. Comments: Hardcover small octavo, sewn binding; Numbers: (10) & 152 double pp. – Prayerbook: (4), 31 double–, 133 (87 of which are double), & 29 double pp. Masorah and Tefillah texts on right, translation on left side of double page. Scripture texts in single column, no extras. The Psalm headings in the Prayer–Book part are translated. There‘s no Preface written for this fourth volume. Joshua • Judges • I Samuel • I Kings • Isaiah • Jeremiah • Hosea • Micah and Zechariah. Contents: Book of Deuteronomy w/ Haphtaroth. – 30 chs of Psalms • Proverbs 31 • I Chr. 16 & 29 • Neh. 9. – Prayers etc. (see above), and "The Ethics of the Fathers" (Pirkei Avoth פרקי אבות). – Index to Vol. V.
Comments: Hardcover small octavo, sewn binding; Deutronomy: (10) & 142 double pp. – Prayerbook: (4), 31 double–, 133 (87 of which are double), & 29 double pp. Masorah and Tefillah texts on right, translation on left side of double page. Scripture texts in single column, no extras. The Psalm headings in the Prayer–Book part are translated. There‘s no Preface written for this fifth volume. Joshua • I Samuel • I Kings • Isaiah • Hosea • Joel and Micah. Below a photo of all five volumes, 2nd edition; it is not clear whether or not they had been rebound.